Heavy bags are great. They are a necessary part of boxing training, MMA training and Muay Thai training. Any legitimate gym worth its salt will have their students hitting one of these bags at some point in their training sessions. 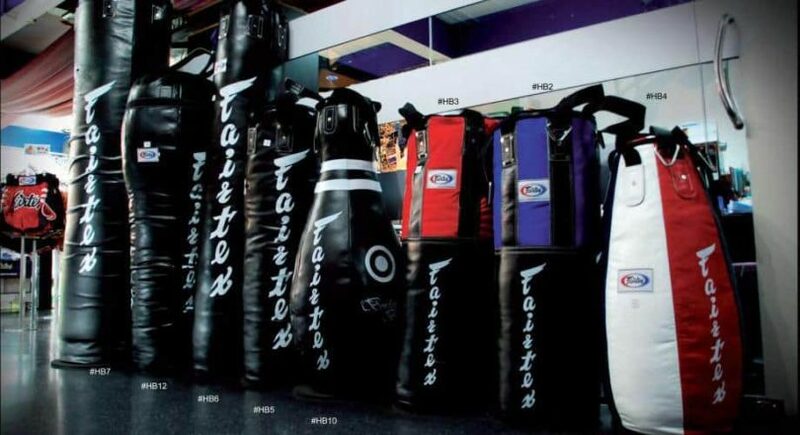 These heavy bags allow you to practice your big, heavy strikes and combos in a way that you just can’t replicate in any other training environment. You can’t throw those kinds of strikes at a speed bag and you can try to really go to town on your opponent in a real fight but it’s a lot more difficult when the bag can hit back. The only issue with heavy bags is that they are meant for punches. Of course you can throw an elbow at them and the occasional knees but they were originally designed with the purpose of taking hand strikes in mind. Try kicking a short, thick and dense heavy bag with untrained shins and watch as you immediately drop to the floor in pain. If you wish to practice kicks and knees at full force, especially low kicks like leg kicks, then you’ll need to use a Muay Thai bag. A Muay Thai bag is just like a heavy bag except that it is longer and thinner where heavy bags tend to be shorter and fatter. Most Muay Thai bags will often brush against the floor so you can easily practice those devastating low kicks you’ve seen on TV without breaking shins… yours or your training partners. This Muay Thai punching bag is 6ft tall, or 7ft tall when you include the 12 inch straps to attach it to the ceiling. It comes pre-filled with 130 pounds of sand but due to the incredible durability and toughness of the bag it can be further filled to weigh up to 300 pounds in total. If you choose to fill it further, the increased weight will prevent the bag from swinging as much but will make the heavy bag a harder, more dense target to hit. So if you’re brand new to throwing kicks, start off with a light bag and increase the weight in small increments, if you feel the need to, as your shins become accustomed to hitting the bag. Outslayer also give you a ten year warranty, so if the impossible happens and the bag breaks just from your strikes, they’ll give you another one at no additional cost. Ringside have crafted this heavy bag out of resilient power-hyde materials so that it can withstand any assault you throw at it, be it in your personal home or even a commercial gym where the bag is used constantly. The bag also only weighs 100 pounds which will allow beginners to practice throwing big, heavy strikes and kicks without hurting themselves or over-exerting themselves. Some cheaper bags end up settling at the bottom and becoming denser there as they take sustained beatings. This can be very aggravating if you’ve purchased the bag to focus on low kicks, so you’ll be happy to know that this bag keeps it’s shape and constitution no matter how hard it’s hit. Fairtex only make the best of the best Muay Thai products. Their banana bag is handmade with the same master level craftsmanship you’d expect to get when buying a pair of Fairtex gloves or shin-pads. Fairtex know Muay Thai and they know exactly how their bags are going to be used and what kind of punishment they can expect to sustain over their long lives. This isn’t a company that is jumping on the bandwagon and just chucking out shoddy quality punching bags; Fairtex know what they’re doing. The bag is perfectly formed to handle punches, elbows, knees, kicks and can even be manipulated so you can practice your Muay Thai clinch with it. It ships unfilled but it’s very easy to fill the bag to your required weight and consistency and have at it. If you’re desperate to practice your Thai clinch and actually be able to do those violent, vicious knees you’ve seen your favourite fighter do, then this bag will have you salivating. The tear drop shaped bag is absolutely perfect for practicing your clinch and your knees. As it’s a tear drop shape, the top of the bag is more narrow to allow you to clasp your hands together easily and twist and turn the bag as you desire. This same shape also allows you to work awkward angles with your punches. You can easily train strikes like uppercuts and body-hooks with this bag in ways that would simply be impossible with standard heavy bags and banana bags. The premium leather construction and heavy duty water resistance lining means that it can face a daily onslaught from the entire gym without giving in and falling apart. Muay Thai bags, or banana bags as they’re sometimes called, tend to be lighter than their heavy punching bag counterparts. They’re also longer and thinner which means that they can sometimes swing wildly back and forth after being struck. Whilst this can be good for your ego, to see the bag go flying, it can be a pain when you want to practice heavy combos but the bag keeps rocking back and forth before you can land anything decent. Outslayer have remedied this in two ways; you can clasp the bottom of the bag as well as the top of it so it can’t move as wildly and the bag can also be filled further to a weight of almost 300 pounds. The bag is also filled with fabric only instead of sand. Sand is easier to source and fill, but it does have a tendency to settle at the bottom of the bag and for the bag to just generally lose it’s consistency over time. With fabric, you’ll find that the bag retains it’s shape and structure a lot better. If you want to hone those heavy leg kicks then there’s only really one choice you have. We’d all love to have a trainer on our beck and call so we can practice leg kicks on the pads over and over again but not even professional fighters have that level of luxury. The next best thing is a Muay Thai heavy bag. You can kick any of the above bags all day, every day and it’ll still be hanging and ready to go for the next session.